Plano has a thriving events calendar full of unique activities throughout the year. Holidays make for an especially great time to visit, with entertainment available in downtown or one of Plano’s fine parks. From cultural festivals and seasonal celebrations to arts events, there are always fun events in Plano. The following are some of the most popular annual events and festivals in Plano to attend during your next visit. Experience the largest model train show in the North Dallas area. Whether you’re a novice or a seasoned engineer, you’ll find something interesting at the show. The Dallas Area Train Show has operating layouts, dealer displays, "how-to" clinics, and video displays. Many home layouts will also be on tour. The long-running music festival produced by local country station KHYI “The Range” goes down in Plano’s Oak Point Park. Expect the two stages to feature the same mix of Americana, country, and folk the station is known for. This family-friendly event will introduce you to various aspects of fly fishing. Both experts and novices can learn more about where to fly fish both locally and abroad. Multiple name brand companies from across the country are on hand to help you discover what products and trips are right for you. There are fly fishing guides and fly shops, kayak experts and instructors teaching a wide variety of topics. Those over 21 can sample and purchase micro-brew beer from various Texas microbreweries. Plano Artfest is a free community event built around artistic inclusiveness, creative curiosities, and cultural connection. The festival includes a week of community art programming that culminates in a two-day festival in the Downtown Plano Arts District. Enjoy live music, contemporary art installations, performances from local arts groups, a makers market of craftsman and artisans, family chalk art, a kid’s zone with bounce houses, and much more. Come let your creativity loose! Every second Thursday April to November, sample selected wines, hear live music, and enjoy curated art exhibits at your favorite shops in the downtown arts district. Experience Asian fashion, martial arts, music, and more at the annual Asian-American Heritage Festival in Haggard Park. The kids can try musical instruments or paint while you track down the best Thai, Chinese, Indian, and Japanese food. Night Out on 15th Street is a community dining experience during which you can eat a meal with friends as you are surrounded by the historic beauty of Plano’s arts district. Find your seat at the 300-foot-long table down the middle of 15th Street, where arts district chefs will prepare a culinary tasting paired with select beer, wine, and spirits. You’ll also enjoy a pre-dinner reception with live entertainment held in McCall Plaza, featuring craft cocktails and music. Choreographed music accompanies the explosions at Plano’s Independence Day fireworks show in Oak Point Park. Bring your blankets or lawn chairs and celebrate with your fellow patriots. 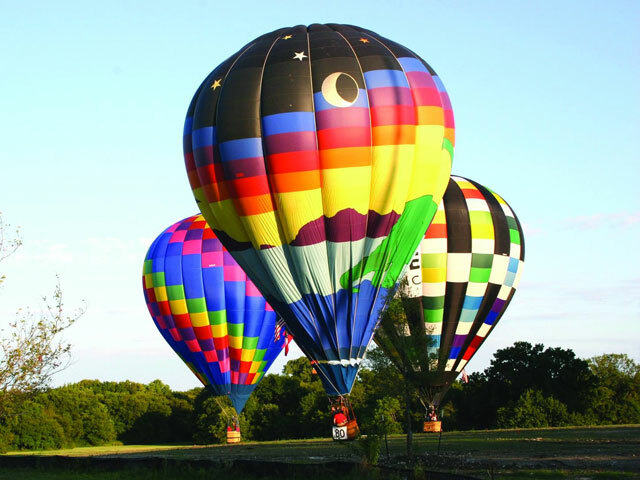 Come for the brightly colored flying orbs and stay for the fireworks, skydivers, kid’s games, food, and entertainment at this beloved annual event. This free family-friendly event features over 100 wines, food from 20 different delicious restaurants and food trucks, talented musicians, local artists, beer and cocktails, culinary demos from North Texas culinary experts, a play zone for kids and 60+ boutiques and shops! This cultural affair in Haggard Park includes a flag parade, international art exhibit, music and dance performances, a wellness fair with free health screenings, and more. Prost, Plano! This free, family-friendly, Oktoberfest-style event celebrates outstanding beer, great food and the right kind of polka music to get you and your friends dancing in the street. The Wiener Dog Fashion Show, Kids Yodeling Competition, Stein Racing Contest, Brat Eating Contest, and the Strong Man Contest are just a few of the popular activities you can expect at Steinfest. Bring a little holiday glee to your annual shopping spree by combining fun and festivity with some productive holiday list-checking at Lights at Legacy. Enjoy holiday crafts with Mrs. Claus, magic with Mr. Scrooge, rides on the Christmas train, live entertainment, caricatures, face painting, plus the lighting of the 65-foot Christmas tree. Photos with Santa will also be available. Free to attend. This Christmas event in Plano gets its name from the storytelling you can hear during the event in downtown’s Haggard Park. There is a tree lighting, carolers and other performers, food vendors, and a visit from the man in the red suit.